Think that you do not have the kind of green fingers required to keep your leafy friends happy, instead of letting them wilt away? 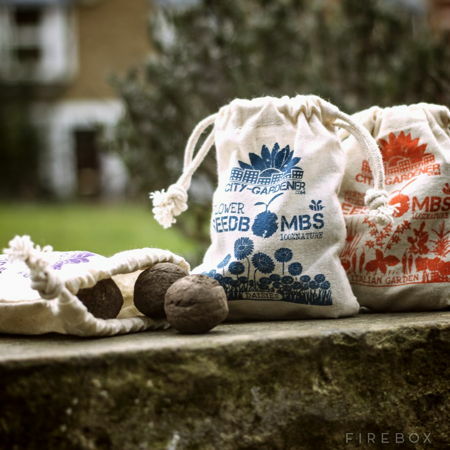 Here is a way to help you out – the £9.99 Seed Bombs, which so happen to be biodegradable garden grenades which disperse an abundance of seeds. It will be able to rain down ecological “hell-fire” into the neighboring flower beds, where each linen bag will hold 10 walnut-sized bombs. Each of these linen bag will be filled with their fair share of species-rich seed-infused shrapnel. Just throw and grow, allowing you to add more variety to the blooms in your garden. Instead of “plug and play”, all that you need to do is “throw and grow”. Needless to say, this is completely biodegradable.